"The manner in which Senator McCain, Governor [Sarah] Palin and their supporters refer to Senator Obama is creeping toward hate speech," Rabbis for Obama said in a statement on Thursday. "They [the McCain campaign] recently used a uniformed sheriff to warm up the crowd at a rallyby emphasize the senator's middle name," the rabbis wrote. "At another event Senator McCain seemed shocked when one of his supporters stated that Senator Obama was an 'Arab.' 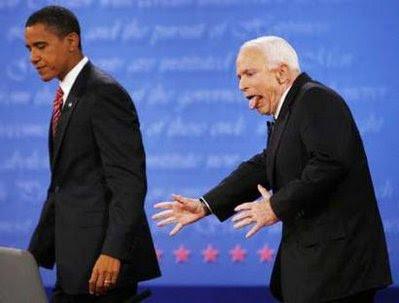 That false belief is the fruit of the McCain campaign's emphasizing Senator Obama's middle name." The rabbis also accused Vice Presidential candidate Palin of asserting that "Senator Obama pals around with terrorists," a claim that denounced as "false" and "built on three distortions and a lie." "They [Republican Jews] know that in the Jewish community this is the moral equivalent of crying fire in a crowded theater," the liberal rabbis said, adding: "The RJC approach harkens back to the classic Republican red baiting tactics of Joe McCarthy and Richard Nixon from the early fifties." Now I'll tell ya'. If there are any people who know from hate talk, it's them Jew-ish rab-bis. They has been hate-talked to foah ye-ahs.